As summer is finally here in Chicago, if you haven't already, its time to start cooking outdoors! Friends and family are always drawn to the "heat" my husband and I bring to the grill, whether its a juicy steak or a grilled pizza. Today I am featuring a grilled pizza, guaranteed to be served with a crispy charred bubbly crust and a plethora of mouth watering toppings, vibrant sauces, and fresh garnishes. The combinations and flavors you can create are limitless. Carnivores and herbivores alike can create their own flavor rainbow with color and texture. 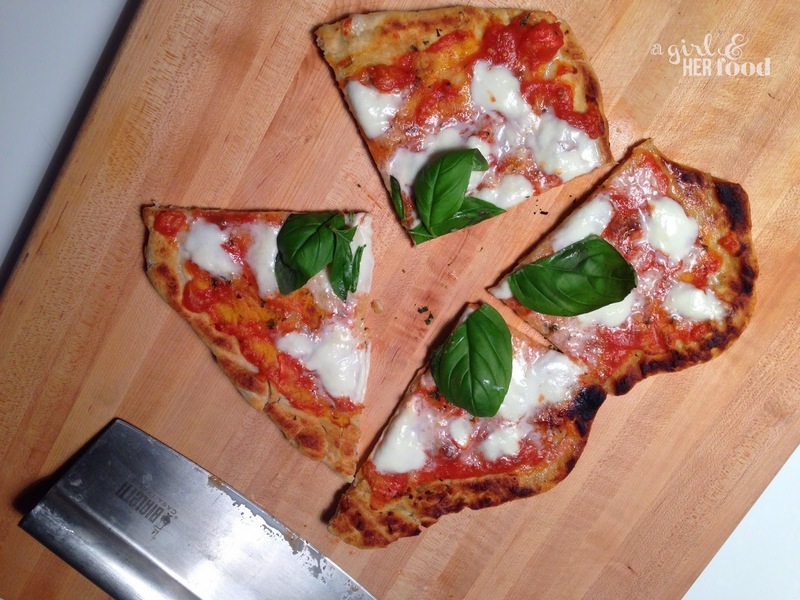 Today I will guide you on grilling a basic Margherita pizza. There's no shame in buying fresh store bought pizza dough; I can't always make my own yeast-risen dough so I turn to the dough masters at Whole Foods, Trader Joe's, or a local pizzeria. However, making your own dough is easier than it sounds and I include my recipe below. Pour warm water into a small bowl. Add the yeast and sugar and stir until the yeast dissolves, it must be smooth and beige in color. Let it rest and stand for about 5 minutes to make sure the yeasted water is active, as a thin layer of foam should form on top. Set aside. Next, add the flours, salt, and cornmeal to a standing mixer. Using your dough attachment, set on the lowest speed, combine and mix all the dry ingredients. Add the yeasted water and the 2 tablespoons of olive oil to the mixer and mix on the slowest speed allowing the dry and wet ingredients to combine together slowly. I recommend scraping down the sides of the mixture with a spatula. Set the mixer to medium high speed and let the mixer knead the dough for about 2 minutes, forming into a ball. If the dough is too wet or sticky, add some more flour to help prevent from sticking as it should come off the sides cleanly and form a ball. Put the remaining 1/4 teaspoon of olive oil in a bowl and place your dough ball in the bowl. Turn the ball over several times to coat it with olive oil. Cover with plastic wrap and place in a warm and draft free place for 2 hours until it rises to almost double in appearance. Chill the dough in the refrigerator overnight or for about 1 hour to firm it up before grilling to make it easier to handle. Before working with the dough, let it stand at room temperature for about 20 minutes. Place dough ball on a clean work surface that is lightly floured. Punch down the dough gently to remove gas. Flatten the dough with your hands to about 1 inch thickness and cut in half. Put one piece of dough in the center of the floured surface and sprinkle flour over the top of the dough. Using the rolling pin, begin rolling out the dough starting from the center out to the edges about 1/4 inch thickness. I don't like perfect round pizzas, I prefer the charactertisc of rustic and unrefined look. Sprinkle the crust with a generous layer of flour so it makes it easier to transfer the dough without sticking. Position a rimless baking sheet or pizza peel and transfer the dough onto it. Place all the ingrediesnt in a bowl and mix well. The herb oil will keep in refrigerator for about a week. Leftovers can we used for marinades for meats, fish or veggies. Preheat your grill to high heat. We use our gas Weber grill and turn it to medium high setting, closing the lid for about 10 minutes before placing the dough on grates. I recommend putting olive oil on a paper towel to grease the grates as it will prevent the dough from sticking to the grill. When your grill is ready, slide it off the rimless baking sheet allowing the dough to slide flat onto the grill. The dough should cook for about 3 minutes and will begin to bubble and it will begin to set and firm up. Gently lift edge and peak underneath with thongs and ideally you want the underside of the dough to become charred, but not burnt (as pictured above). Once it is ready, remove the pizza from the grill and flip it over so the charred side is face up on the baking sheet and the uncooked side is face down. You will then brush the cooked side with the her oil, add your sauce, cheese, and toppings (ingredients listed below), before returning the pizza to the grill for a few minutes to cook the bottom. After a few minutes, your pizza will be done. We like to then take the pizza off the grill and place it under our broil for a few minutes to add a little color and crispness. Top with fresh basil leaves, slice, and serve! Enjoy!